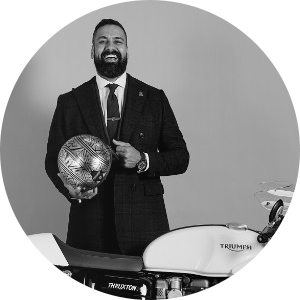 Mark Hawwa the founder of one the world’s fastest growing charity events ‘The Distinguished Gentleman’s Ride’, is an entrepreneur taking the custom bike scene by storm with his “can do” spirit. Mark’s philosophy of giving everything a go has seen him build a flourishing event management career through the things he’s most passionate about, supporting people in need and classic motorcycles. Building communities around the cafe’ racer and custom motorcycle scene such as Sydney Cafe’ Racers and Australian Cafe’ Racers, saw Mark develop friendships and ideas that have grown well beyond his wildest dreams. Mark’s charity project ‘The Distinguished Gentleman’s Ride’ is now recognised as the world’s largest charity motoring event raising funds for Prostate Cancer Research and Mental Health and has raised over $25m for Men’s health.